I participated in my first blog gift swap recently. I LOVE to shop for gifts and REALLY love to shop for a bunch of little things to put together. Unfortunately, I forgot to snap a photo of the gifts I sent to my blogging gift swap partner. However, here's what the lovely Randa over at About Life (be sure to check out her blog...someone is getting married soon) sent to me. Dark chocolate espresso snack mix, dark chocolate Godiva chocolates...can you tell I emphasized my love of dark chocolate in my "favorite things" list? Thanks to Meg over at Life of Meg for hosting the Fall Frenzy Blog Gift Swap. It was great fun. Uhmmmmmm.... If you come home and this is all gone, I know nothing about it! Just sayin' from one dark chocolate lover to another! What a great idea. 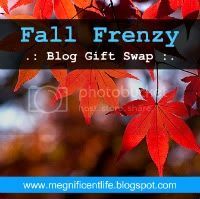 I had never heard of a blog swap before. How did you two get hooked up? Oh my gosh!!! What a GREAT gift, and so cute! I am so happy that you had such a great time, girl! Thank you for posting so I could see - not many people did! You're the BEST! I'm glad you like it! I'll be posting your gift tomorrow - sorry for the delay but I absolutely loved everything you got me!